I can never thank Allah enough for having you as a part of my life and being able to celebrate yet another year with you. You have grown so much and sometimes you just drive me up the wall but more often than not, you have always made me laugh hysterically over your antics. I want you to know that every waking hour I spend with you is lovingly treasured and kept in a secret part of my memory so that if I lose my memory one day, I hope at least those memories will stay and bring a smile to my face every single day. Umar Khalif, I want you to know that the days reaching to your magical 2 was not an easy feat for me. You had a high fever measuring around 40.5C when we were in a foreign country and you looked so weak as you kept nursing in my arms. I asked you a couple of times if you could stay strong for me and your answer was a pleading “no”. Please don’t scare me like that again. However, you are definitely stronger than I thought you were. Who would have thought that the ambulance ride to the hospital in Istanbul was such a joy for you? You were smiling throughout the journey as I whispered in your ears, “We are riding in an ambulance and Abah is driving the ambulance.” Of course, your Abah was not driving the ambulance. I said that as you kept asking for your Abah who was sitting in front with the driver. When the nurses pinned you down to draw some blood from you, you were crying murder. I thought the pain was excruciating but you stopped immediately when I said, “Ok done, baby.” You were jumping from one toy to another at the paeditrician while waiting for your results. You did not look sick at all although you were running on high temperature. Why am I telling you all these honey? In life, you will be facing with lots of challenges to reach your destination. I want you to know that you are stronger than you think you are. Never give up the pursuit to your dreams because only you can make it happen. For the time being, I pray to Allah that you will recover soon. I ♥ you to the moon and back, baby. 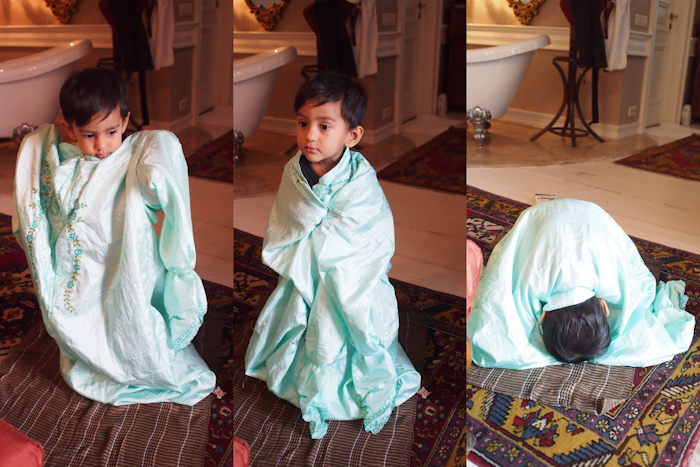 That’s you baby wearing Ummi’s prayer garb right after I was done with my prayers. May I be an exemplary example to you, InsyaAllah. 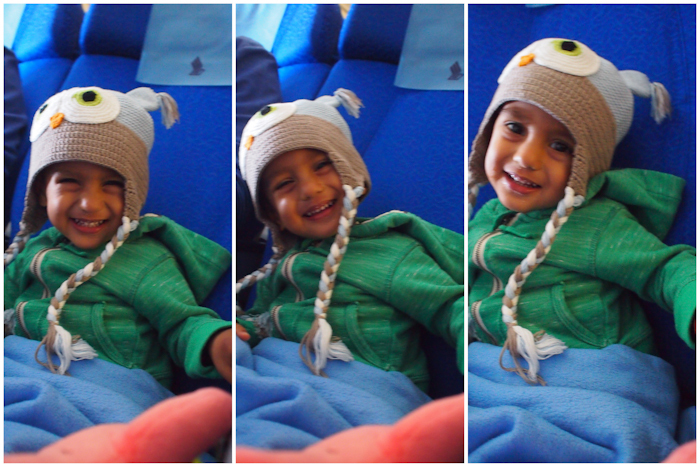 11 hours flight and a high fever. Any smile from you was truly precious.